The Tri Cavalier King Charles Spaniel Car Mats, designed to fit in any car, will add a spark of personality to your vehicle that any dog owner would be jealous of. These car mats featuring your best friend will not only keep your car clean and dry with their rubber backing, but they will also stay clear and vibrant with their soil resistant material. 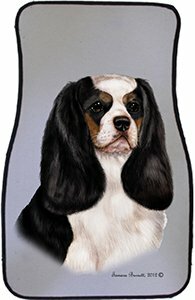 The Tri Cavalier King Charles Spaniel Car Mats painted by renowned artist Barbara Van Vliet measure 24 x 16 inches and are made of a very luxurious light grey carpet. Get into your car every morning and be greeted by the amazing picture of your Cavalier King Charles Spaniel which is bounding out of the mat to meet you.